Slang is a key part of language learning, and today I have a guest post from Mexican tutor Raúl Jiménez who clearly loves and knows his native slang extremely well. Raúl has collected so many of these cool Spanish slang expressions that he decided to make them into a Kindle book for you (and me) to keep and take to Mexico with us. 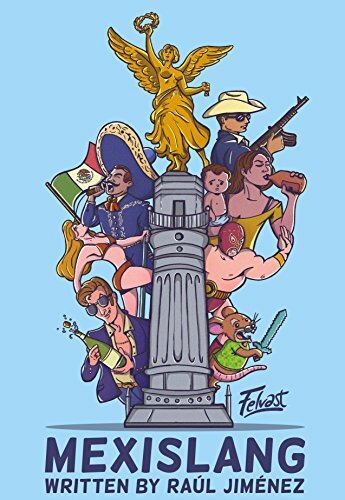 This book is a great tool for anyone who wants to understand Mexican and Latin American culture a little better and it's out now on Amazon - an absolute steal! Read below for his awesome list of 32 expressions that could not be more Mexican if they tried. I have been tutoring Spanish online for over 2 years and, while talking to some of my students, I noticed that many, even the ones who were already pretty good , were having troubles with things that we traditional teachers can take for granted. Things like sayings, expressions, and even the everyday swearing that you hear over the streets. In other words, we teach them the language, but we don’t teach them enough slang for them to master it. Slang is different in every culture, and it renews itself and changes constantly day within day. Right now, words and trends spread faster because of the internet, and certain towns and subcultures have their very own slangs, within a single country, which can be extremely frustrating while learning languages. It’s unavoidable to deal with slang, and it’s very important to fully understand not only a language, but a country’s own culture. Take English for example. If you say “Write your John Hancock in this paper” means to have that paper signed, because John Hancock had a very prominent signature on the declaration of independence. But if you are not American, you’ll probably would never know this historical and cultural context hidden behind the expression. Another example is malinchista, or malinche, from Mexico.In order to understand this term, first you have to know who the “Malinche” was. La Malinche was an Aztec woman who lived during the time of the Spanish Invasion in Mexico. She was offered as a slave to Hernan Cortez (the leader of the Spanish Occupation). After spending some time with the Spaniards, la Malinche learned Spanish quickly and she became a spanish-nahuatl interpreter working for Cortez. She eventually became his mistress and advisor. Her contributions proved essential for the Spanish conquest of Mexico and the fall of the Aztec Empire. Because of this, la Malinche is seen as the ultimate symbol of national betrayal. Her character gave birth to the term “malinchista”, which means “a Mexican that prefers foreign things”. There really isn’t an English equivalent to this, as well as there isn’t an Spanish equivalent for Jhon Hancock. Take for example, the word “coger”. In Spain, this is a very common word. It means to grab someone, or something. But in Latin American Spanish, this is a very strong word, equivalent to the F-word in the English language, and if you use it without knowing this, it can offend someone, or even worse, get you into huge trouble. When someone speaks the same way you do, it’s easier to get along with them and you trust them more. Speaking slang correctly makes it easier to make new friends, and it makes you look current and knowledgeable about a culture different of your own. Most of my students are American people, who want to talk to Latin American people living in the US, so when I saw they were struggling doing this because they were lacking slang knowledge, I decided to do something about it. It literally means being salty, but in Mexican slang it means that you are “unlucky”. He comprador billetes de lotería por años y nunca he ganado. Estoy bien salado. I’ve bought lottery tickets for years and I’ve never won. I’m so unlucky. In Mexican slang, ponerse las pilas (put batteries on yourself), means you are motivated to put all your attention, effort an energy into something, so you won’t get taken by surprise, and to do the best work you can on that task. It’s the Mexican slang equivalent of “Turn on the juice”. Todavía puedes pasar el semestre. Ponte las pilas./You still can save the semester. Turn the juice on. Moctezuma, was one of the last Aztec kings. He was the leader of the Aztec Empire at the time of the Spanish Invasion in Mexico which resulted in the demise of the Aztec civilization. Once the conquistadors had control over Tenochtitlan (ancient Mexico), they soon became fond of Aztec cuisine, eating all sorts of banquets. However, the Spaniards were not used to all the spicy ingredients in Mexican food. Therefore, a lot of them ended up getting sick, suffering from indigestion and diarrhea, some of them, even dying. This was known as “Moctezuma’s vengeance”, as if the Aztec Emperor was cursing them from the afterlife through Mexican cuisine. Nowadays, when a foreigner comes to visit Mexico and gets sick because all the food that he ate here was just too much for his stomach, we call that “La venganza de Moctezuma”. Mi amigo de Alemania se comió como quince tacos. Le gustaron mucho, pero ayer en la noche le cayó la venganza de Moctezuma. / My friend from Germany ate like fifteen tacos. He liked them a lot, but last night, Moctezuma’s vengeance fell upon him (he got sick). To fool or to take advantage of someone. It comes from the word “chamaco”, which means “young kid”, so chamaquear implies that someone tricked you as if you were a naive little kid. Te chamaquearon, pagaste demasiado por ese auto./They fooled you, you paid way too much for that car. To talk gibberish, to babble or to talk in circles. It comes from Cantinflas, a Mexican comedian who was famous for talking in circles and giving rambling speeches in his movies. Because of that, we made a verb out of him. Cuando hablo en público, me pongo nervioso, y a veces cantinfleo./When I speak in public, sometimes I get nervous, and I start to babble. To exchange something. Everything seems to indicate that this term was invented by “Chabelo”, the host of a long running Mexican children tv show where kids participated on many games to win prizes. At the end of every show, the Catafixia took place. In this final challenge, the children had to choose between keeping all the prizes they had won so far, or exchanging them for a secret prize, which could be something way better than what they already had or way worst. Te catafixio unas cheves por unos cigarros. Give me some cigarettes and I’ll give some of my beers. A serious problem or something troublesome, it could also mean a fight or a conflict. ¿Puedes ayudarme? Tengo una bronca./Can you help me? I have a problem. Resolver estos ejercicios de matemáticas es una bronca./Answering these math exercises is a pain. No quiero que haya broncas entre nosotros./I don’t want it to be conflict between us. Hubo bronca en la fiesta de ayer./There was a fight in yesterday’s party. A tianguis, or rodante are the names given to street markets in Mexican slang. These are very colorful places that take over the whole street and sell all kinds of stuff, like low quality Chinese/Mexican ripoff toys, used clothes, pirated CDs and DVDs, but also fruits, meat, spices, exotic remedies and whatever you can imagine. Here, you’ll hear a lot of noise, including: “cumbia” and “banda “music in the background, and sellers yelling at people walking by, trying to sell their products. They call “marchante” to the costumers, because they are “marching” through the streets seeing all the stuff on sale. There’s some rodantes that have schedules, and move from place to place within a city depending on the day, and some that are always in the same place, like the most famous one, Tepito on downtown Mexico City. ¡Es neta, güey! ¡Yo no lo hice! /It’s the truth, dude. I didn’t do it. ¿Es neta?/For real? Dad or mom. Of course, “jefe” actually means boss, but we also nickname our parents in that way because they always represent an authority figure. Vamos al cotorreo. Mi jefa me va cuidar a mi hijo. Let’s go to the party. My mom is going to take care of my son. Very informal way of saying “yes”. Simón, voy a hacer lo que dice. Yes, I’m going to do what he says. Very informal way to say “no”. It’s not used for constructing sentences. You can’t say “Nel iré” instead of “no iré” (I won’t go). It’s used to just answer “no” mostly. Some people also say “naranjas” instead of no, and it’s used the same way as “nel”. Ex. -¿Quieres salir a comer? -Do you want to go out to eat -Nel. -Nah. Song. People use “rolón” for a very good song. ¿Cómo se llama esa rola? What’s the name of that song? ¡Que rolón! What a kickass song! A person with a very over the top behavior after getting drunk. It could be aggressive, sad, noisy, or disrespectful, maybe even a combination of all. People who cry, yell, annoy others, start doing weird dances or get into fights after drinking are considered to be “mala copa”. It literally means “bad glass”. Puedes venir a la fiesta, pero no bebas, porque te pones de malacopa. / You can come to the party. Just don’t drink, because nobody can stand when you get drunk. Hangover. Literally, it means raw. Ando bien crudo./I’m hangover. A hug. From it, we get the verb “apapachar” which means to hug. This word actually comes from the Nahuatl verb “pachoa”, which means to protect or to cuddle. Me apapachó tan fuerte que me saco el aire. He hugged me so hard he took the air out of me. Eye-candy. To enjoy looking at someone that we find attractive. Me gusta ver el voleibol femenino en las olimpiadas por el taco de ojo./ I like to watch female volleyball on the Olympics because of all the eye-candy. In Mexican slang, a luchona (fighter), or Mamá luchona, is a young irresponsible single mother who still lives with her parents. This term became an internet meme, when some women posted on social networks that they were fighters and strong for raising their child all alone. It became a form of mockery, because lots of “mamás luchonas” live with their parents, go out to party and let their kids with their grandparents, and are not mentally mature, resourceful, independent or responsible at all. Bendición actually means “blessing”. However, in Mexislang, it refers to the offsprings of the luchona mothers. The reason why we call them like that is because people here say that “A child is always a blessing” whenever an unplanned child is coming. People popularized the term “bendición” in social media and it’s now used in modern Mexican slang with this meaning. A Mirrey (Myking- with no space between the words) is commonly a young Mexican man, who is a member of the upper class, or tries to look like one. He always brags about the tons of money he or his family makes, however, his family might not even be that rich. He’s always talking about his crazy adventures and wild lifestyle. Their dress code is always to have a shirt, two or three buttons undone, no matter if the weather is cold. They are a group of people who are always trying to be perceived as of higher value compared to the rest of the population in both real life, or social media regardless of whether they possess that higher social status at all. If you want to find a real example, google Roberto Palazuelos, or the singer Luis Miguel, who is even called Luis Mirrey by some people. The video-parodies “Quiero ir al Antro” and “Acapulco Dreamers” are also good and funny examples of what a mirrey is. Literally “ratboy” or “ratkid”, this is the name people in Mexico and Latin America have given to pre-adolescents with a squeaky voice, that spend most of their free time playing videogames online (most of them not intended for their age), and scream, yell and insult other players. They tend to be very young, from, let’s say, 8 to 15 years of age, and their biggest stars are YouTube videogame streamers, who they love almost religiously. It became a very popular trend/internet meme. If you do something mean to a player when you are playing online, you may get called “niño rata” in a teasing manner. The real inspiration for this term is an early episode of the Simpsons, where Homer calls Bart a “Ratboy”. It comes from the phrase “ni estudias ni trabajas” (You don’t even study and you don’t even work), and it means exactly that. A Nini is a young person who doesn’t have an occupation nor goes to school, and just hangs around with his friends while living with his or her parents. Literally “to turn oneself into a duck”. Its real meaning is "to play dumb". Mi exnovio está celoso de ti,pero se está haciendo pato hablando con mi hermano./My ex-boyfriend is jealous of you, but he is playing dumb talking to my brother. Literally “to take the soup out”. This expression means that you are making someone tell you the truth about something or simply, getting out information from them that they consider to be secret or may be reluctant to tell you. Voy a sacarle la sopa sobre cómo consiguió su fortuna./I’m going to make him tell me how he got his fortune. “To put a lot of cream to your tacos”. It’s used to express when someone brags a lot, and thinks a lot of himself or herself, even if he or she may or may not live up to that. Es buen jugador, pero a nadie le agrada, porque le echa mucha crema a sus tacos./He is a good player, but nobody likes him because he brags way too much. This expression literally means “You would be jumping”, and it’s really used as a Mexican slang equivalent of “you wish”. -Voy a ganar la lotería -I’m going to win the lottery -Brincos dieras. -Yeah, you wish. This expression is referring to Benito Juarez, one of the most important presidents in Mexico’s history and it literally means “It does to me what the wind did to Juárez”. It’s real meaning is “It doesn’t bother/affect me”. There are certain myths about the origin of this expression. One of the most popular ones relates to a painting of the president holding a Mexican flag. In the painting, the flag is drawn with a lot of wind waves, like if the president and the flag were facing an intense wind current. However, unlike the flag, the appearance of the president looks impeccable. His suit and his hair appear to be completely unaffected by the wind. The president seems to be immune to everything that’s going on. Yo no me emborracho fácil, el alcohol me hace lo que el viento a Juárez./I don’t get drunk easily. Alcohol doesn’t affect me. This expression means that something is good enough. Ya vente vestido así. Sí das el gatazo./Come dressed like that. You look good enough. Literally: “The clown has taken you away”. It means that something terrible has happened to you or it’s about to happen to you. Many people believe that the origin of this expression comes from the universal fear of clowns that most people experience, however, it appears that this expression actually originated in the world of Rodeo Riding. In a Rodeo competition, when a cowboy is riding a mad bull or horse, there’s always two (or more) people inside the field, paying close attention to what’s happening and intervening whenever the rider falls. These assistants are called “payasos” which means clowns in Spanish. Their job is to distract the animal in whatever way possible so that it doesn’t attack the rider and if the rider gets badly injured, it’s their duty to take him out of the field as fast as possible. So, if you are a rider and you got carried out of the field by a clown, it means that you have failed and you got badly injured. La maestra te sorprendió copiando en el exámen. Ya te cargo el payaso./The teacher caught you cheating on the exam. You are in big trouble. In Mexislang, this expression means that you are in deep pain, you are in serious trouble or you are about to perform a very difficult task. Its literal meaning is: “to deliver twins”, because it compares the intense pain women experience while going through this with your situation. Estudia hoy o vas a andar pariendo cuates el día del exámen./You should study today, or you’ll be having a hard time the day of the evaluation. Did You Learn a New Word? These 32 explanations and expressions are just the beginning - in his emails with me, Raúl mentioned that he has collected 300 on his blog by now. Impressive! Head over to www.mexislang.com to dive even deeper into these wonderful expressions. Which one is your favourite? Leave a comment below and share your own best slang.